The name Claire has Latin roots meaning bright, which is fitting since this sweet-natured girl is guaranteed to brighten anyone’s day! 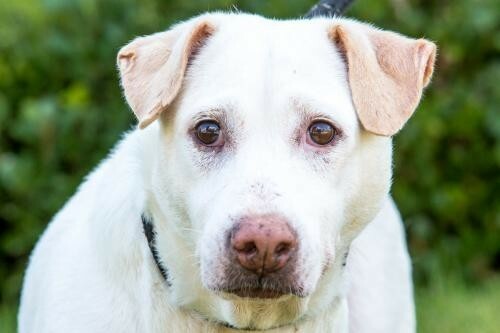 Meet Claire, a gorgeous cream-colored 5-and-a-half-year-old Lab mix. Claire is a Soi Dog rescued from the illegal Dog Meat Trade (DMT) in Thailand. She and a group of her friends were rescued from the Soi Dog Foundation facility in Phuket and flown stateside in September 2017. She is very easy on a leash. Though she may seem a little modest and reserved at first meeting, Claire is a very friendly, mellow, easygoing, playful and affectionate pup once you get to know her more. She engages in active play with her dog friends and loves human attention. Give her a scratch on her backside and she’ll lean in for more! Claire is a great medium size of roughly 40 pounds. How can you resist those sweet brown eyes? If you'd like to meet Claire, please visit www.thebarkinglot.net/adopt.